What a first hunting season for 13-year-old Mike Marshall of Oregon. 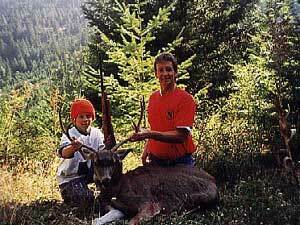 Mike has hunted with his dad from the time he could walk. On Sunday morning of the opening weekend of the blacktail rifle season in the Cascades, Mike was walking down a road with his younger brother, Scott, and his dad. A 21" three-point blacktail was easing up a well-used trail and heading through the brush. Mike made an elk cow call with his mouth and the buck turned toward him. With the buck presenting a quartering-away shot at a distance of 82 yards, Mike collected his first deer. Mike took the really nice buck with an open-sighted .308 rifle. 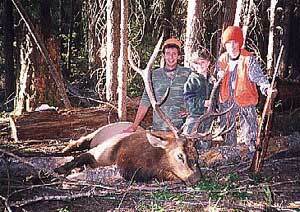 On opening day of the Cascade bull elk rifle season, Mike was once again hunting with his dad. That morning they found too many hunters where the dad wanted to go, so that afternoon they drove their truck to the Butte Falls area. This was the place Mike had wanted to be on opening morning. On the drive to this area Mike had marked an X on a shell and told his dad, "This is the bullet I'm going to get my bull with." While his father and his father's hunting friend were getting into their packs and getting their hunting gear ready, Mike simply told them he was going to kill a bull and would meet them at the bottom of the hill. With both adults just ready to step into the woods, Mike was 200 yards from the truck when he kicked up a cow in the brush and it spooked a 6x6 bull just 50 yards away. The bull hopped up from its bed behind a log and tried to make its exit. With only the bull's head and neck visible above the brush as it ran straight away, Mike put a bullet into the back of its skull and dropped it skidding in its tracks. The young hunter stated he next wanted to shoot a big muley and a pronghorn. He probably will!